Nearly 10 million women in the U.S. have diabetes, a disease that frequently leads to heart disease, stroke, damage to the nervous system, and even amputations. But diabetes doesn't "just happen." It starts out as pre-diabetes. While diet and exercise are vital for avoiding pre-diabetes and diabetes, there are some nutrients that can stop these conditions in their tracks. Let me tell you about them. More than 40 million people in this country alone have blood glucose levels higher than normal, but not high enough to be called diabetes. You may have heard about pre-diabetes under a different name. It's also called insulin resistance, syndrome X, or metabolic syndrome. They all point to an imbalance in blood sugar regulation. If you think that because you eat a healthy diet low in processed foods and sugars you don't have this problem, I have news for you. Many people I talk to about metabolic syndrome are surprised to find that they have it. Even with a fairly healthy diet, you can still have pre-diabetes. That's the bad news. The good news is, there are nutrients that stop metabolic syndrome in its tracks. They take away sugar cravings, promote weight loss, lower cholesterol and triglycerides, lower blood sugar, and increase energy. These nutrients are backed by modern science and use both Chinese and Ayurvedic medicine. But do they work? Just ask Jessie. She eats a whole food diet with only an occasional sweet. While she craves sugar, she doesn’t eat it often. Her energy is constantly dropping and spiking. Although she didn't have all five indications (see below) of metabolic syndrome, it was still at the root of her problem. She began taking these nutrients and, within a week, her sugar craving was gone. She now has even more energy that lasts throughout the day. Mary was in the same boat. She was so addicted to sugar she had no control over her urges. After eating sweets, she crashed. She was caught in a vicious cycle until she took these nutrients. Now she has no sugar cravings. On those rare occasions when she eats a little sugar or has a glass of wine, she's fine. No low blood-sugar crashes. No low energy. And Alice couldn't lose weight. She took these nutrients before meals and noticed decreased appetite with little or no urge to snack. She dropped nine-and-a-half pounds in the first month ... effortlessly. There are five primary indications of metabolic syndrome. If you have two or more of them, you are at risk for diabetes. These symptoms are: fat around your middle, high triglycerides, low HDL (good) cholesterol, high blood pressure, and high blood sugar. Insulin resistance impacts most of these. In some cases, it can even lead to periodontal disease and memory loss. Insulin resistance means your body needs more insulin than it can produce. It’s “resistant” to making the appropriate amount. This occurs when there's too much insulin in your bloodstream — from genetics or a history of eating foods that turn into sugar quickly. 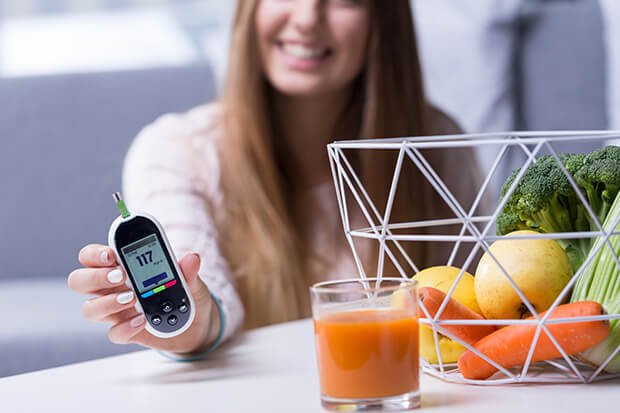 When your body is working normally and you have excess blood sugar, your pancreas produces insulin to lower your sugar to a manageable amount. Some sugar is stored for later use. But when you're insulin resistant, your body doesn't get the message to store sugar in your muscle and fat cells. The result is high blood sugar. Whether you have diabetes or metabolic syndrome, the following nutrients can help balance your blood sugar. These nutrients can reverse insulin resistance, decrease sugar cravings, and decrease the absorption of both fats and sugars. Some nutrients have a direct effect on sugar metabolism. They reduce insulin resistance, slow down the absorption of carbohydrates, enhance insulin secretion, and reduce the amount of insulin your body needs for glucose metabolism. • These begin with chromium, a mineral that has been shown to regulate blood sugar. Most supplements contain 200 mcg of chromium. Taking one or two daily should be enough to help reduce sugar cravings and regulate your blood sugar. • Gymenema reduces insulin resistance and purifies the blood. Studies show it also slows down the absorption of sugars. • Fenugreek seeds lower cholesterol and triglycerides, and have anti-diabetic effects that erase most symptoms of metabolic syndrome. • Holy basil reduces blood sugar and is high in antioxidants. Remember, diabetes is an inflammatory condition, and antioxidants are powerful anti-inflammatory nutrients. • Then there's Cassia, otherwise known as cinnamon. It's a powerful spice that reduces the amount of insulin necessary to metabolize sugars. These are the nutrients you can take to regulate blood sugar. But there are a couple of herbs that help with digestion, reduce thirst, and calm the heart and kidneys. Diabetes frequently progresses to heart disease. These herbs even help regulate the heart. • This group of herbs starts with American Ginseng, which studies have found to prevent a sharp rise in blood sugar after eating a meal high in sugars. • Then there’s Ophiopogon, which regenerates cells in the pancreas. It also treats the fluid imbalance that causes so many diabetics to urinate frequently and be thirsty. One of the overlooked reasons people end up with metabolic syndrome and diabetes is because of deficiencies in their body. There are nutrients that help correct physiological imbalances throughout the body. For instance, medicinal mushrooms can support people at high risk for diabetes, and sodium alginate from seaweed can slow the absorption of fats and sugars. But that’s not all. Other nutrients, such as alpha-lipoic acid (a powerful antioxidant) and L-taurine, improve insulin sensitivity and reduce the buildup of triglycerides in muscles. These help lower triglycerides and weight. L-taurine is a sulphur amino acid that reduces the production of free radicals in blood fats. This translates into lower cholesterol and higher levels of good HDL cholesterol. There are other metabolic-targeted nutrients that can help you avoid and treat metabolic syndrome and diabetes. But this list is a good place to start. They can repair the body's blood sugar regulation mechanisms. It’s also important to make dietary and lifestyle changes. You can't eliminate pre-diabetes on a junk food diet, or while eating a lot of sugar and processed foods. And you need to exercise. But get the right kind of nutritional support and you can reverse your metabolic syndrome and reduce your risk for diabetes, heart disease, memory problems, and even gum disease. Challem, J., et al. Syndrome X, John Wiley & Sons, 2000. "Stroke," Circulation, June 2007. Yaffe, K. "Metabolic syndrome and cognitive disorders: Is the sum greater than its parts?" Alzheimer Dis Assoc Disord, April/June 2007.